This latest generation material is highly water resistant, light & compressible for easy storage, 100% UV resistant and is very durable. We include reinforced metal eyelets in the front & rear wheel area of our motorcycle covers allowing locking cables & devices to secure both bike & cover! 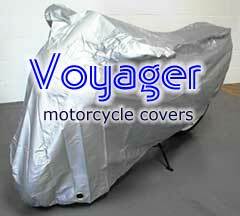 CoverYourCar Voyager motorcycle covers ideally suit both traditional bikes & sports bikes with mirror pods. They are available in several different sizes. To select the appropriate size, measure the bike around what we would call the bike ‘waist’ from the front apex of the front wheel to the rear apex of the rear wheel (absolute front to absolute rear). You should measure the bike with a flexible tape measure & run it around any fairings & pannier boxes. Then measure the other side to ensure that they are the same & add the two dimensions together. Then select from our drop down below: - PRICE VARIES ON SIZE SELECTED. Voyager PLUS : Upgraded by the UK Factory to include our integrated unique 360 Degree Hemline Tension Skirt.